As part of the Institute for Latino Studies’ Transformative Latino Leadership (TLL) Lecture Series, special guest Dolores Huerta will participate in a public conversation with ILS Director Luis R. Fraga. A 3:45 p.m. reception will precede the 4:30 p.m. event on Tuesday, February 13th in the McKenna Hall Auditorium. Huerta, along with César Chávez, co-founded the United Farm Workers (UFW) and is one of the most influential labor activist of the 20th century. 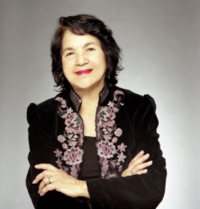 She is president of the Dolores Huerta Foundation whose mission is to create networks of healthy, organized communities pursuing social justice through systemic and structural transformation.